Delight in the classic combination of milk chocolate and REESE'S signature peanut butter in a fun Easter egg shape. They're perfect for Easter baskets or a festive gift for friends and family. The perfect addition to every Easter basket on your list! Ingredients: Peanuts, Milk Chocolate (Sugar, Cocoa Butter, Chocolate, Nonfat Milk, Milk Fat, Lactose, Lecithin (Soy), PGPR Emulsifier), Sugar, Dextrose, Chocolate, Nonfat Milk, Contains 2% or Less of: Vegetable Oil (Cocoa Butter, Palm, Shea, Sunflower and/or, Safflower Oil), Salt, Whey (Milk), TBHQ and Citric Acid to Maintain Freshness, Lecithin (Soy), Vanillin, Artificial Flavor. Seem To Taste Better Than The P.B. Cups! Don't know why, must be in my head, but these taste a little better to me than their plain peanut butter cups. Buying them in this package is a better deal price wise. Always look forward to these p.b. eggs around Easter time. These are my favorite. I look forward to them every year. So much better than Reese cups, a lot more peanut butter. The candy was much fresher than the candy in the stores by me in Detroit. Great tasting chocolate with a yummy peanut butter center that satisfies sweet and salty craving. 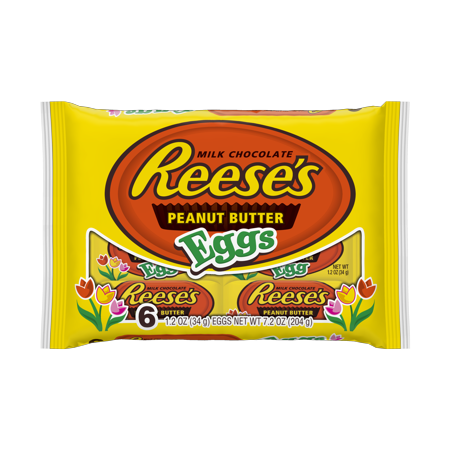 i think these are the best peanut butter eggs out there even better than the homemade ones.